Today is Iain's and my fifteenth wedding anniversary. Typically, on our anniversary, I write a little something and post it with my favorite photo of us, at the Indiana Dunes, shortly after our quickie courthouse wedding. For example. 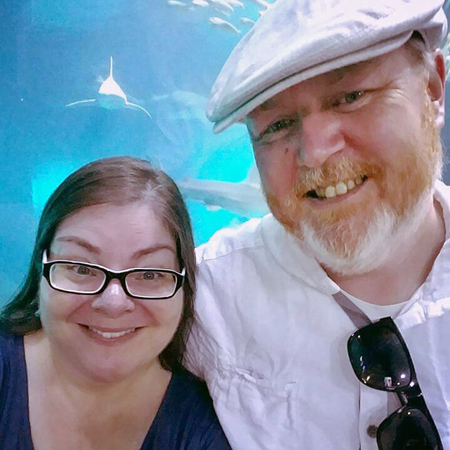 This year, I chose a different picture—one of us from April, when we spent the day at an aquarium. The same two goobers, fifteen years on. I can't speak to what was going on in Iain's head at that moment: All I can tell you is that I know that face pretty well after 16 years together, and that looks like a pretty happy expression to me. I can, however, tell you what was going on in my head, in case it isn't evident from the look on my face. It was something like: Eeeeeeeeeeeeeee I am having so much fun! OMG IT LOOKS LIKE THAT SHARK IS SWIMMING TOWARD ME LOL! This day is great! This aquarium is great! Iain is great! I LOVE BEING HERE WITH HIM! I love him! Yayayayayay! LOL. No poker face. For good, bad, and extremely dorky. Had someone asked me the day of our wedding what I'd want our marriage to look like, I'm not sure what I would have said, but I suppose it would have been something fairly vague and uncreative. I probably would have said something about trust and something about humor and something about romance. I don't think I would have said: Someone whose company I will still enjoy just as much, or even more, in fifteen years. It seems so obvious. But it also seems very elusive. Anyway. I started writing a whole thing, but the truth is that no words can convey more clearly than that picture how much I still enjoy Iain's company after 15 years.